Swing, Jitterbug, Push, East and West Coast Swing, Spot Turns, Slow Dancing, and the Latin Spot Dances (Rhumba, Cha-Cha, Samba and Mambo) are danced toward the center of the floor within a limited space, thus giving other dancers room to complete their patterns. Please do not use the corners of the hall for Swing dances, as this reduces a major portion of premium floor space for proper Line of dance. Fox Trots, Waltzes, Tangos, Polkas or Two-Steps are always danced counter-clockwise (Line of Dance). This allows dancers to circle the floor in a systematic fashion. 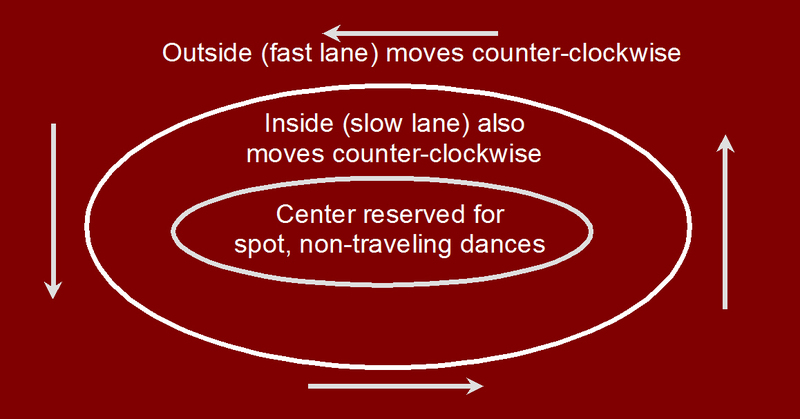 Outside lanes are used by faster dancers, inner lanes by slower dancers, and the center of the floor, as noted above, is reserved for dances that do not travel. When entering and leaving the dance floor, every effort should be made to avoid colliding with dancers in progress. Regardless of fault, apologies should be extended whenever dancers are accidentally kicked or bumped. Standing floor conversations are to be discouraged, so as not to impede the natural flow of dancers. By observing these guidelines, the traffic patterns of the various dancers will be significantly improved and the desires, enjoyment and different skill levels of all members will be more easily accommodated. To avoid embarrassment, all guests should be informed of these rules by the host member.